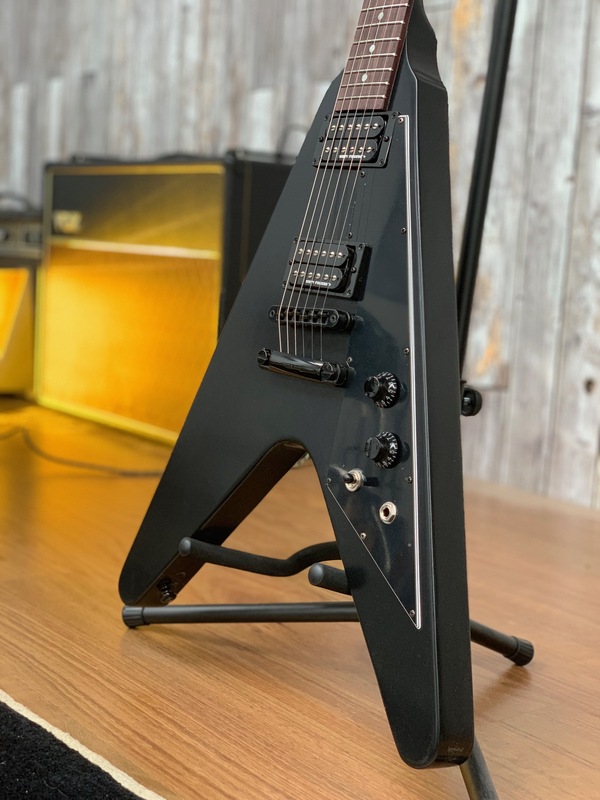 Part of the New 2019 Gibson Guitar Range, is the Gibson Flying V B-2 Satin Ebony 2019 model. Which is part of the Tribute Series. Satin Black Finish with black chrome hardware and equipped with Dirty Fingers + pickups delivers aggressive styling, sound and performance. All mahogany construction, rosewood fingerboard and fast , slim taper neck. One volume, one tone and 3-way pickup selector switch keep controls intuitive and essential. This guitar has a Mahogany Body , Rosewood Fretboard, and utilises Dirty Fingers Plus Pickups with Grover Rotomatic Tuners with Kidney Buttons.